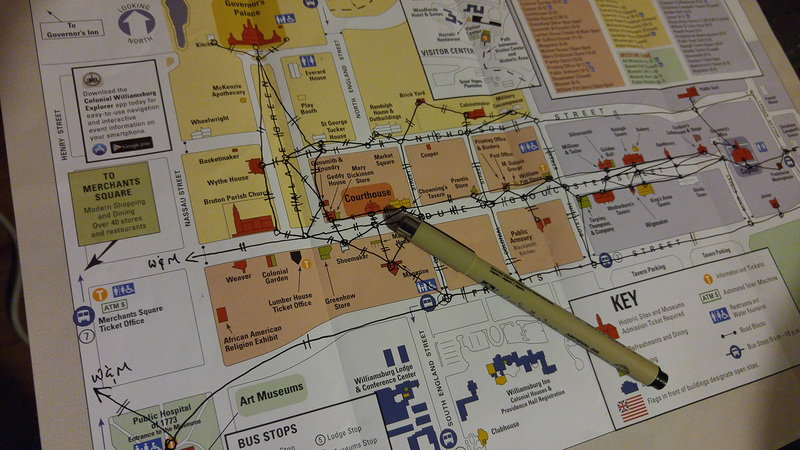 Maps are essential to many Interactive Fiction games, especially those that involve activity in various locations. 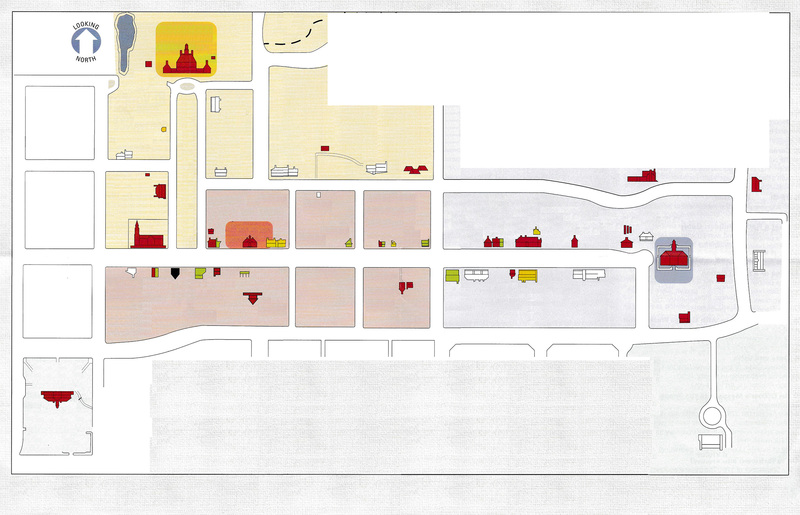 Interactive Fiction game maps that deal with real locations, however, are challenging to implement, as there is a trade-off to be had between realism and playability. If the design is meant to represent the physical layout with utmost fidelity, the details of the map can potentially slow down and frustrate game play as the player is forced to move from one seemingly meaningless location to another in order to get to the desired destination. It’s similar to the counterpoint between a flight simulator and a flight game–the realism of a true simulator can be very boring, unless it’s the simulation itself that interests you. Likewise, the conflicting visions of the HWLN: is it a simulation of the physical layout of Williamsburg as it was in the months leading up the signing of the Declaration of Independence, or is it a game about the events taking place during that time? That conflict plays itself out everytime I return to the map and struggle with the appropriate level of detail to include. I’ve been wanting the game to be both, but that may not be the wisest choice for the HWLN as a game. Part of the challenge was addressed in part by the new daily maps published by the Colonial Williamsburg Foundation for visitors. The new map (show in the picture above) is actually a streamlined version of an earlier visitor map which you can view here. 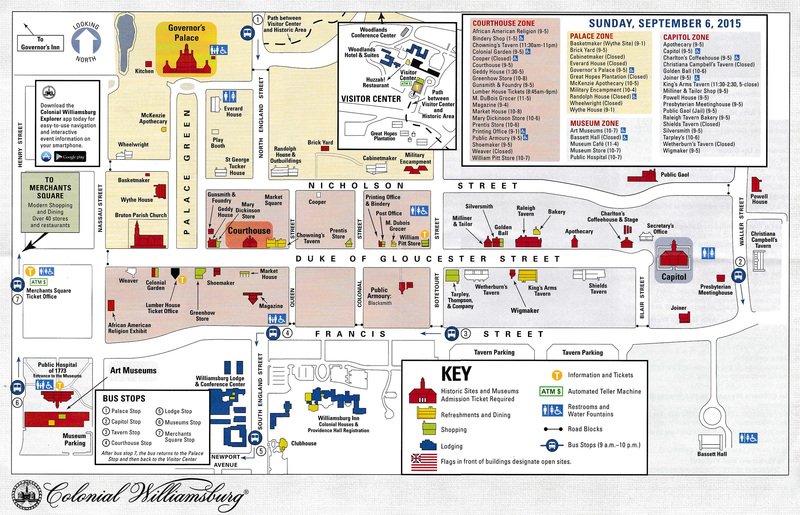 The older map is much more detailed, and perhaps in the Colonial Williamsburg Foundation’s thinking, it was not as user friendly. Whatever the case, the new map gives me a good template for a more streamlined game map, on which I am currently working and will implement at least initially in Inform 7. 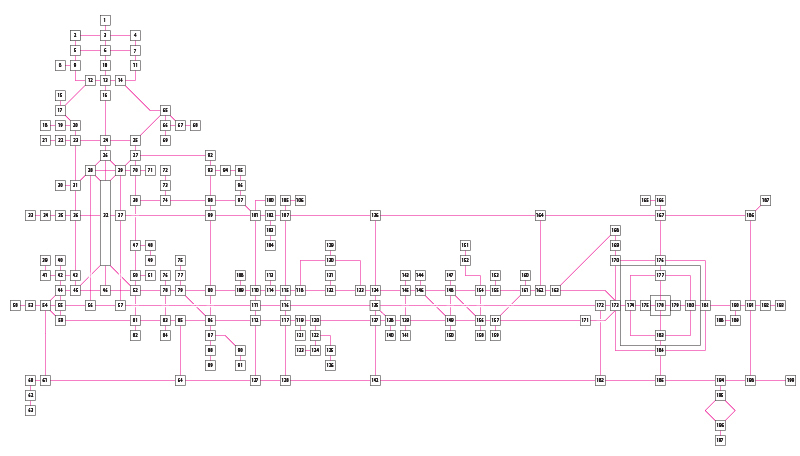 So for the sake of playability, I’ll work with a less detailed map. But at some point, as an exercise in modeling an accurate picture of history, I’ll return to the “high resolution” version in order to satisfy my inner purist. 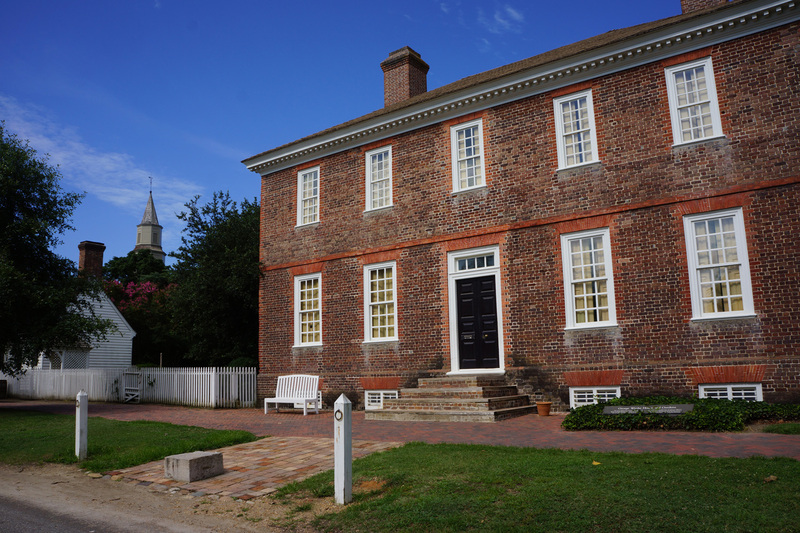 Wythe’s home (located just a few hundred yards away from the Governor’s Palace) was pivotal in the years leading up to the signing of the Declaration of Independence. Key historical figures would often stay at the house as Wythe’s guest, and George Washington even used the house as a field headquarters for a few weeks in September of 1781. The house itself is two stories with a relatively simple interior architecture. The architectural documents I have been able to research make reference to a basement, but the information is not clear enough, nor are there any diagrams, so I’m leaving the basement out of the navigational map for purposes of the game. 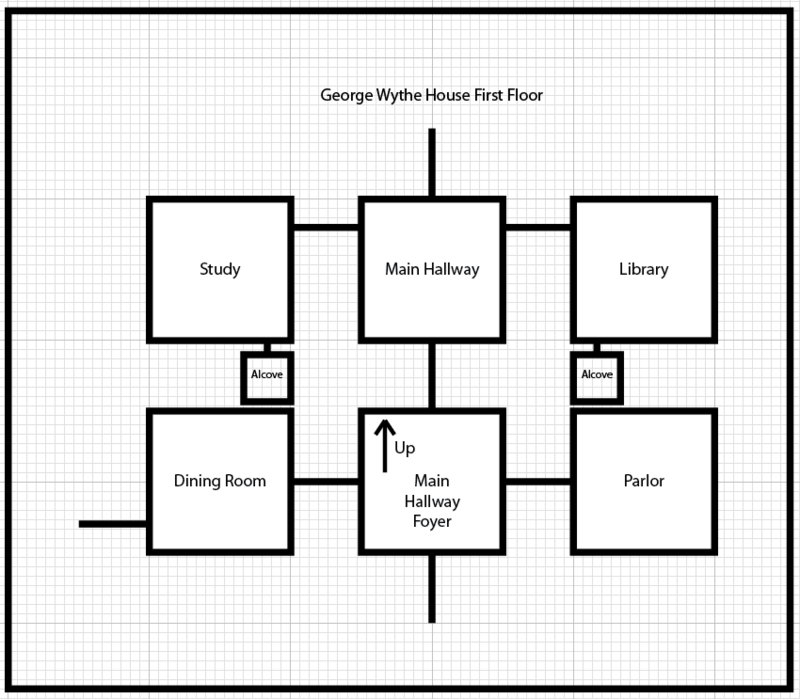 The floor plan to be used in the game is below. 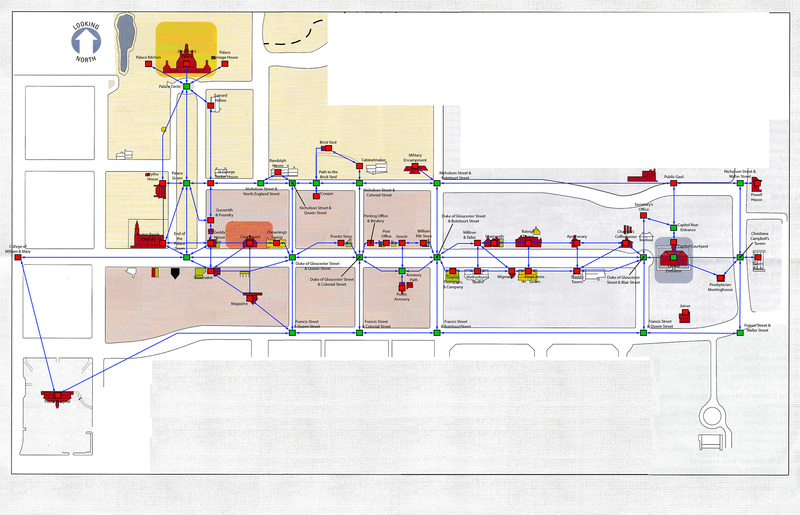 Conversion of the actual physical layout into the game map format was not difficult, largely due to the lack of architectural complexities. 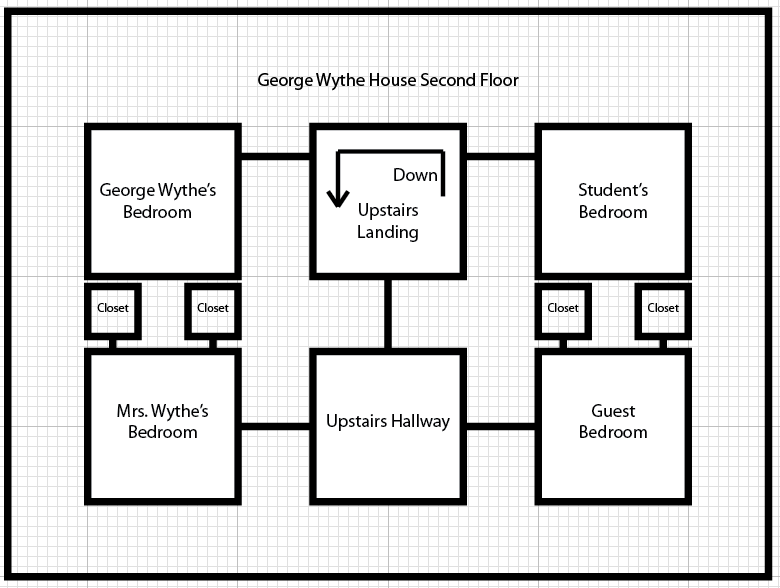 There are ample materials in the research literature to indicate what the interiror of the house was like, and that material will make its way into game descriptions that come up as the player moves from location to location.